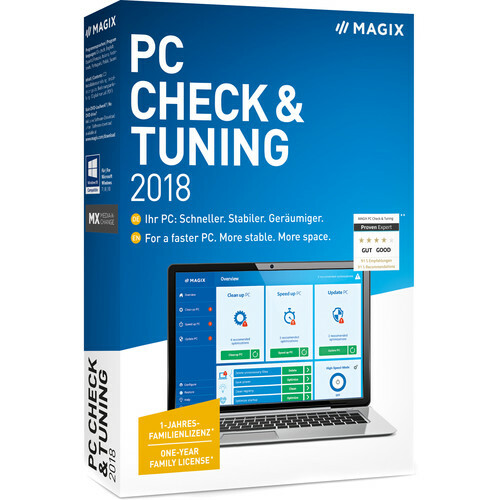 The downloadable PC Check and Tuning 2018 from MAGIX Entertainment enhances the performance of a Windows-based system by disabling unnecessary services, cleaning the registry, updating driver software, and more. This 2018 version of PC Check and Tuning software program sports a new interface as well as redesigned autopilot and system reports, which tell you what changes have been made after the system has been optimized. To speed up a system's boot time, PC Check and Tuning displays all your startup programs and suggests which programs are unneeded. Additionally, it notifies you of large files and programs that are no longer required, so you can delete them and free up drive space. This volume discount requires a minimum purchase of 100 units.